The daguerreotype process was introduced to the public in 1839 by Frenchman Louis Daguerre, and was hugely popular as a medium for portraiture until the middle of the 1850s. To create a daguerreotype, a silver plated sheet was given a light sensitive surface coating of iodine vapour. After a long exposure in the camera, the image was developed over heated mercury and fixed in a common salt solution. The image lies on a mirror-like surface and is best seen from an angle to minimise reflections. The surface of daguerreotypes is delicate and easily damaged, so professionally finished images were presented in a protective case or frame. 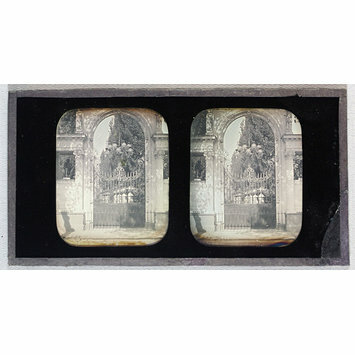 A stereograph is composed of two pictures mounted next to each other, viewed with a set of lenses known as a stereoscope. Taken around 7cm apart, roughly corresponding to the spacing of the eyes, the left picture represents what the left eye would see, and likewise for the right, so when observing the pictures through a stereoscopic viewer, the pair of photographs converge into a single three-dimensional image. Daguerreotype cased photogrpah. A stereoscopic view of an ornate gateway to a garden. 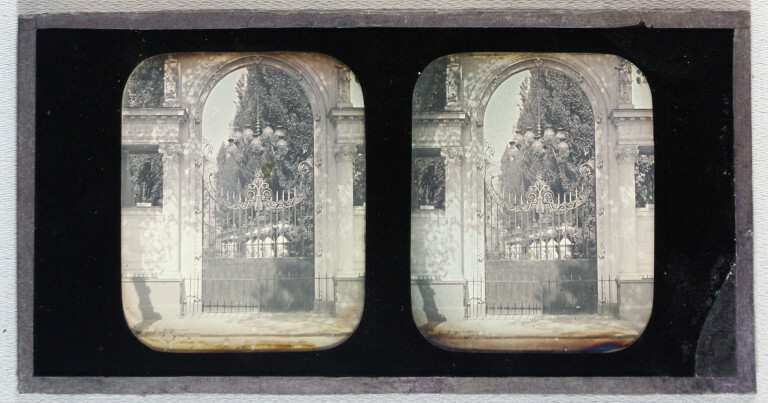 Daguerreotype, cased photograph, stereoscopic view of an ornate gateway to a garden, possibly British, ca.1850.